04.12.2013-24.12.2013. "ART Bulvar" Gallery. 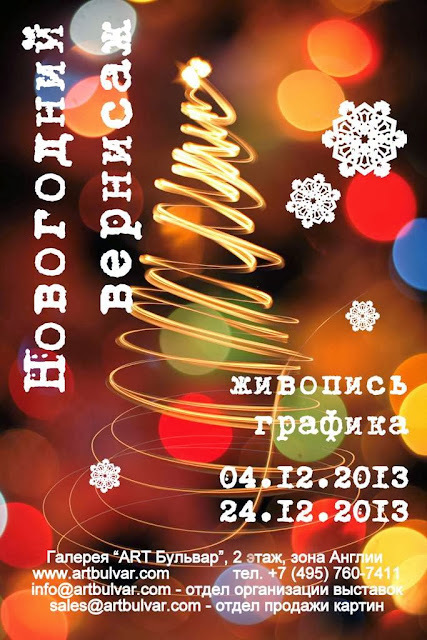 Exhibition of paintings and graphics "New Year's Vernissage." The exhibition is open daily from 10.00 AM till 10.00 PM. Entrance is free. Address: shopping and entertainment center "June", 51, Mira Street, Mytischi. Anna Bocharova (oil paintings, landscape, still life), Paul Wolfson (graphics, pastel, still life), Ivan Krutoyarov (oil paintings, landscape, genre), Vladimir Lityshev (oil paintings, cityscape), Gennady Mihaliov (painting, oil, landscape), Anna Matorina (painting, acrylic, landscape), Catherine Rakitina ( oil paintings, landscape), Natalia Syuzeva (oil paintings, genre), Michael Slastikov (oil paintings, landscape). Exhibits are presented in the Exhibition Catalog.